Commenting on the results Avi Taub, CEO of Shefa Yamim, said: “Shefa Yamim’s gem-box contains very rare gemstones which will form the basis of jewelry which, once manufactured, will be marketed, due to their provenance, as ‘gemstones from the Holy Land"
Shefa Yamim (LSE: SEFA), a precious stone exploration company in Northern Israel, announces that it has updated its Target Mineral Assemblage (“TMA”), following the results of its 14 bulk sampling campaign at the Kishon Mid-Reach Zone 1. The TMA recovered from the 6,384 tonnes sampling campaign in Zone 1 increased from a total of 5,825.24 carats (“cts”) to a new total of approximately 9,778.15 cts enabling the original TMA to be updated to a predominantly gemstone suite (99.5%) of potentially 9 gemstone minerals, including the new addition of spinel, often found in large crystals. Spinels come in different colours such as red, black, violet, and the very rare blue. The overall TMA grade was some 153 cpht (at a bottom screen size of 1 mm), with the grade dominated by 4 Gem Box suite minerals: spinel (69.91 cpht); Carmel sapphire™ (39.36 cpht); garnet (34.09 cpht) and ilmenite (12.06 cpht). “This is an excellent start to our campaign as we move towards trial mining at the Kishon Mid-Reach Zone 1 and progress with Zone 2. The discovery of a 9th gemstone, Spinel, at our project in northern Israel, coupled with the re-classification of ilmenite and garnet to the newly created ‘Gem Box’, further cements our position as a unique multi-commodity explorer. With the “new” gem minerals added to the original “DMCH” suite, viz., garnet, ilmenite and spinel, this higher value collection has been renamed the “Gem Box” suite to reflect the ≥95% gem contribution in Zone 1 of the Kishon Mid Reach alluvial placer. In the revised TMA, only 2 minerals thus fall into the “HIM” industrial category (0.5%): zircon (which may also be a gem at larger sizes) and rutile (Table 1). The revised TMA, dominated by the Gem Box suite, is comprised mainly of minerals that are ≤0.65 cts/stn (85%) with 15% being ≥0.65cts. The largest gems recovered were Carmel sapphire™ 33.3ct, garnet 13.6ct, sapphire 5.7ct, spinel 6.2ct, hibonite 2.8ct and ruby 1.7ct. As Zone 1 has been mapped out as a geologically and geomorphologically “homogenous” section of the Kishon Mid Reach alluvial placer (notwithstanding the expected nugget effect in a natural alluvial system), the results of the 14 bulk samples have been combined per placer mineral to give average recovered grades of these minerals as a first-pass estimation in this Zone (Table 1). The overall TMA grade was some 153 cpht (at a bottom screen size of 1 mm), with the grade dominated by 4 Gem Box suite minerals: spinel (69.91 cpht); Carmel sapphire™ (39.36 cpht); garnet (34.09 cpht) and ilmenite (12.06 cpht). The spatial positioning of the bulk samples from south to north along much of the length of Zone 1, as well as their layout approx. perpendicular to palaeo-flow direction of the ancient Kishon in places, will allow for better geostatistical analyses of the grade and size distribution of the Gem Box and HIM industrial minerals in Zone 1 that will be presented at a later stage. The combined gem and industrial mineral component of the Kishon Mid Reach alluvial placer is referred to as the Target Mineral Assemblage. The “DMCH” gem suite made up of Diamond (extremely rare and mostly small, <1 mm stones; only one record from the Kishon Mid Reach alluvial placer from borehole SY-18), Moissanite (SiC, a rare mineral globally of which the Shefa Yamim prospects host the most abundant and the largest size natural moissanite in the world), Corundum gem varieties namely, Carmel sapphire™ (to date, a sapphire type known only from Mt Carmel and the Kishon Valley alluvial deposits), sapphire and ruby, and Hibonite (another rare gem). The garnet population, which is not of the more common metamorphic origin but was sourced from deeper levels by the Cretaceous Mt Carmel basic to ultra-basic volcanic complexes, is of a gemstone and not an industrial quality. These garnets, which also form an integral part of the so-called Kimberlitic Indicator Minerals (KIMs) suite, were tested further by cutting and polishing several stones, the results of which confirmed their gem quality. Therefore, the Kishon alluvial placer garnets are no longer considered part of the original HIM suite and have been re-assigned to Gem Box suite. The ilmenite, which is also a KIMs mineral, but is generally finer-grained than the garnet, was likewise studied and found to be predominantly of a gemstone and not of an industrial quality. Therefore, the ilmenite population in the Kishon Mid Reach Placer has also been re-assigned to the Gem Box suite from the original HIM suite. Significantly, and in addition to the original TMA suite (described above) that is the focus of the Shefa Yamim Recovery at the Akko facility, the Recovery personnel also pick spinel and other remaining KIMs (e.g. clinopyroxe, chromium diopsides, etc) as a matter of routine. Significantly the Zone 1 placer gravels yielded a considerable quantity of spinel, most of which was gem quality and relatively coarse-grained (3,952.91 cts). Thus spinel has been added as an additional mineral to the original TMA suite. 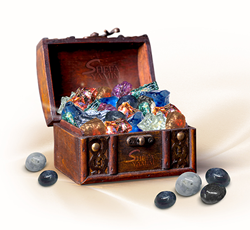 The TMA now comprises of 9 gemstones (in order of abundance): spinel, Carmel sapphire™, garnet, ilmenite, sapphire, hibonite, moissanite, ruby, diamond (not recovered in the Zone 1 bulk sample campaign and only known from borehole SY-18 in Zone 2); and 2 industrial minerals: zircon and rutile. This release has been approved by Dr. J.D. Ward, Consulting Geologist at Majimba Geo-Consulting. Dr. Ward is a qualified geologist (Pr.Sci.Nat), and a leading alluvial diamond exploration geologist with over 35 years’ field experience.